This basic set offers a general-purpose selection of metric combination wrenches in the sizes you'll most likely need for your home projects. Manufactured from chrome-vanadium steel for strength and durability, and heat-treated for hardness, the thin-walled construction of these wrenches makes working in tight spaces easier, while the precision-broached jaws and 12-point box end ensure an exact fit every time. For the professional and avid DIYer, this set of 14 metric-sized combination wrenches is unbeatable for value and versatility. Featuring 14 of the most commonly used wrench sizes, each manufactured from chrome-vanadium steel for strength and polished to a mirror-like finish, the precision-broached jaws and 12-point box end fit provide exact grip in hard-to-access spaces. 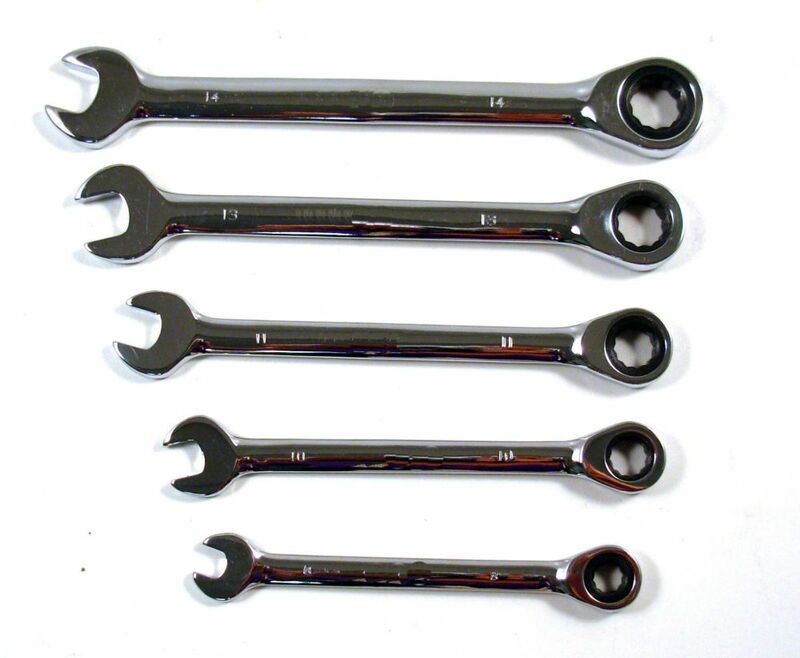 SAE Wrench Set with Ratcheting Box End (5-Piece) Performance is engineered into every one of these wrenches: from the chrome-molybdenum steel that makes them tough as nails, to the two-way ratcheting mechanism that makes any job go faster, this 5-piece wrench set is the perfect combination of durability, versatility and value for the money.